No American military personnel have been killed in Afghanistan for almost a month. The fall in fatalities marks the winding down of the United States' war and occupation there. However, with approximately 64,000 members of the U.S. armed forces remaining in Afghanistan, more fatalities are likely. Meanwhile, Afghan President Hamid Karzai has stated that Afghanistan's forces will not request or support air strikes in urban areas. His announcement follows the death of ten civilians in a recent airstrike. The fall in combat deaths, Karzai's announcement, and the photo of the Tomb of the Unknown Soldier at Arlington National Cemetery highlight two salient characteristics of drone strikes some of which I raised in my previous post Drones and targeted killings. First, drone strikes represent a near-optimal form of risk transfer war, permitting killing the enemy without putting friendly forces at risk. 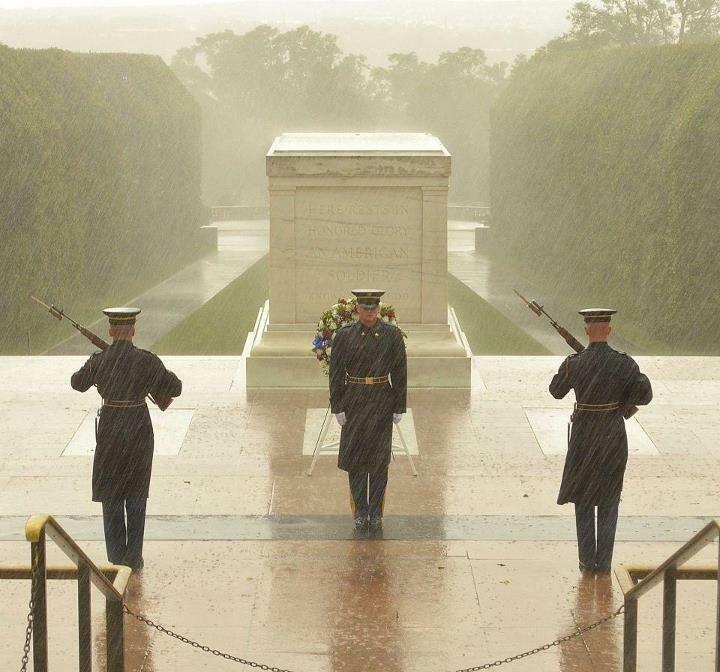 The Tomb of the Unknown Soldier honors military personnel killed in combat in a manner that did not permit recovery of identifiable remains. These deaths are reminders that warfighting has historically been inherently risky for warfighters, thereby creating what ethicists term the moral equality of combatants. Because warriors, friend and foe alike, are legitimate targets for the other side, killing a warrior during a war is morally acceptable, even though it may leave the killer with dirty hands, i.e., moral guilt for having done what was expected, even necessary, in war but is otherwise prohibited. · And projected estimates of blast zones may be inaccurate. 1. Are personnel who authorize and implement drone strikes warfighters or executioners? 2. If warfighters, the attacks presume a state of war and that U.S. military personnel, military installations, and many other government facilities are legitimate targets for the enemy. Who has the Constitutional authority to declare this type of war, the President or Congress? Are the U.S. government and public prepared to accept the premise that drone attacks invite reciprocal attacks on the U.S. homeland? 3. Answering negatively, that drone strikes are not an act of war raises an even more difficult question: what is the source of the legal authority for the attack? If the attack crosses national borders and the other nation(s) do not grant authority for the attack, is the border violation an act of war? Is execution without due process (right to face one's accuser, present evidence, defend one's self with the aid of competent counsel, etc.) legal and, more importantly, moral? What distinguishes targeted killing using drone strikes from the ancient but morally problematic adage that might makes right? In other words, without legal authority, a drone strike resembles a bully or alpha male exercising unilateral control, daring anyone to try to prevent it. Drone strikes seem to me, when conducted apart from formally declared war, to fall between warfighting and law enforcement. Neither set of rules fully applies. But relying upon drone strikes apart from any moral framework invites abuse (power always tempts those who have power to abuse it), chaos (decisions based upon varying, even contradictory criteria), and undermines the rule of law nationally and internationally (as happened with the detention of those the Bush administration called illegal combatants following 9/11). My next post(s) on drones and targeted killing will propose a new set of rules and argue that using drones for targeted killing is morally justifiable but entails risks, moral and otherwise. Drones make for clean hands when fighting outside our country. It is too easy to target a person and not care about the consequences. In today’s world of instant video and internet access, we admire our ability to target and destroy people at a long distance so long as the gory parts are not seen in vivid color. It all looks like an interesting video game that you always win. After the first Gulf War, the Navy said all their new weapons would have video cameras. Of course they never show the bombs that miss the target. If there was a draft and everyone’s sons and daughters were in harms way, there would be fewer and shorter wars. Also if the media had access to people seriously injured or tragically blown up during a battle, we would think a few times before continuing. Drones are great for ridding the oceans of pirates; but we don’t use them for that purpose. We expect to bring the pirates to justice at a great cost to the taxpayer while the pirating continues. Of course we never understand why the people are upset and started their pirating acts. If the other nations or individuals wanted to reciprocate the collateral damage to those in the United States, it is very easy to do. I wonder why it has not happened. It is not because of the FBI, TSA, or CIA. Individuals who are not afraid of dying can do substantial damage to anything or anyone. What is the difference between warfighters who have collateral damage and executioners? The discussion would not have great graveside appeal. Drone activities need to be monitored by people who are not vested in the outcome or the situation. Anyone can have a drone. If both sides of a conflict only targeted those who use their power to get others killed, then there would be less war talk. Ted, Part 3 will appear in a few days and addresses some of the issues that you raise. I disagree that drones make for clean hands when fighting outside our country. What I hear is that people who pilot the drones remotely leave work with a sense of the surreal, a different form of "dirty hands" and post-combat stress than grunts experience.